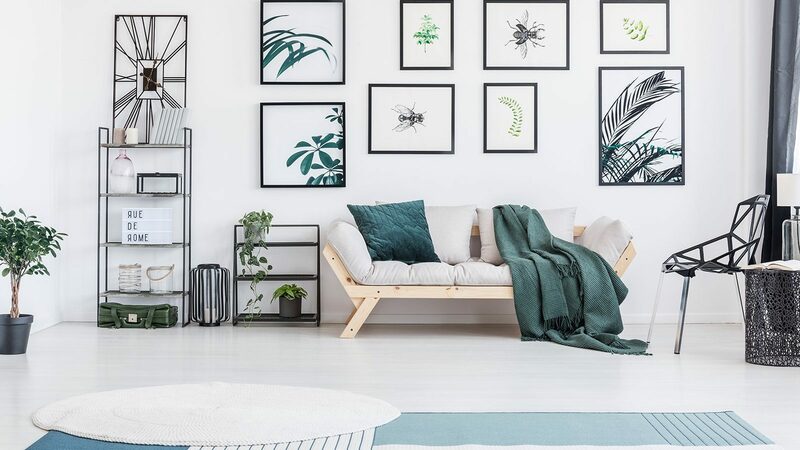 If you’re lucky enough to live near the ocean then your definitely should find a way to incorporate a beautiful ocean view into your interior design. 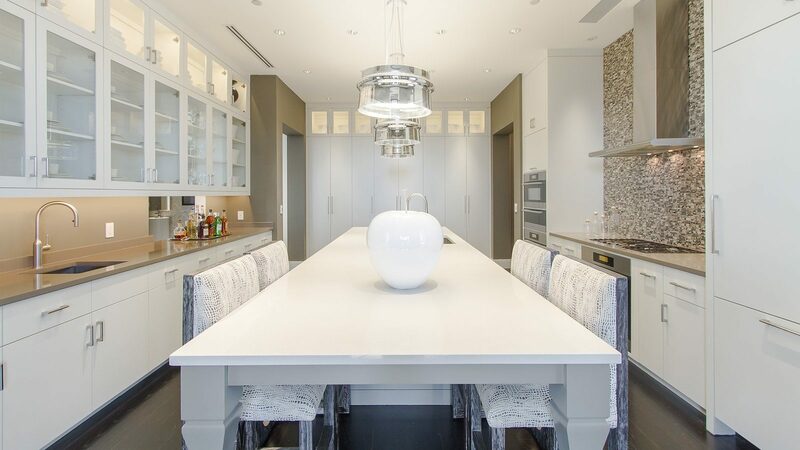 We have the perfect solution, large glass walls or at the very least windows as big as you can get! 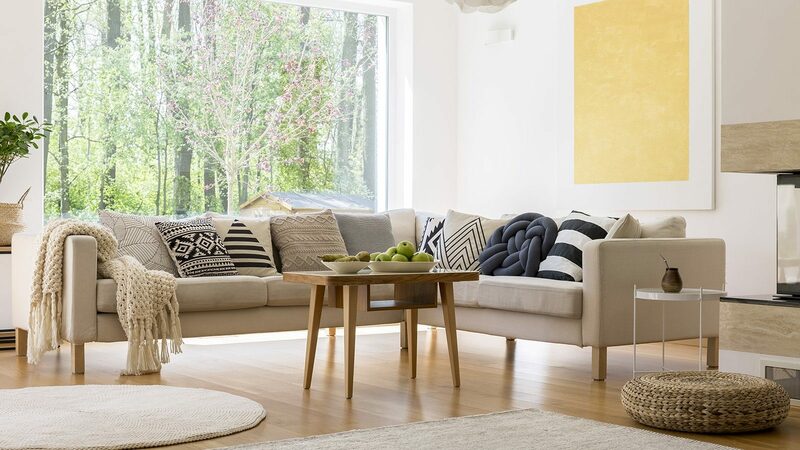 This is the best way to bring the beautiful ocean exterior into your home’s interior. 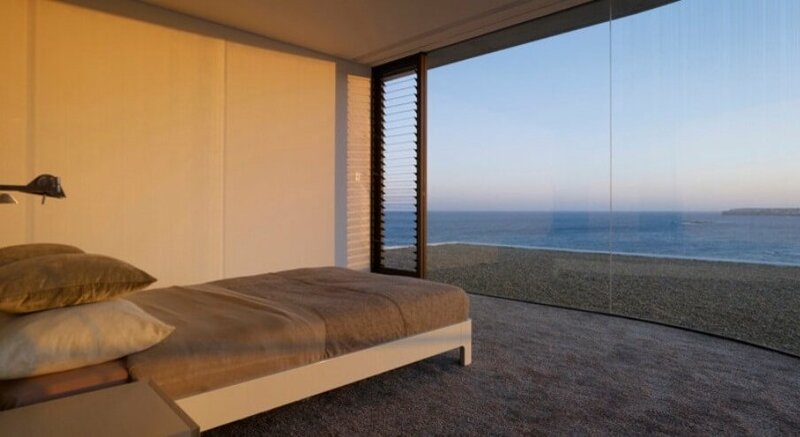 You absolutely can’t beat waking up to a beautiful view of the ocean. It would be the perfect beginning to any day. 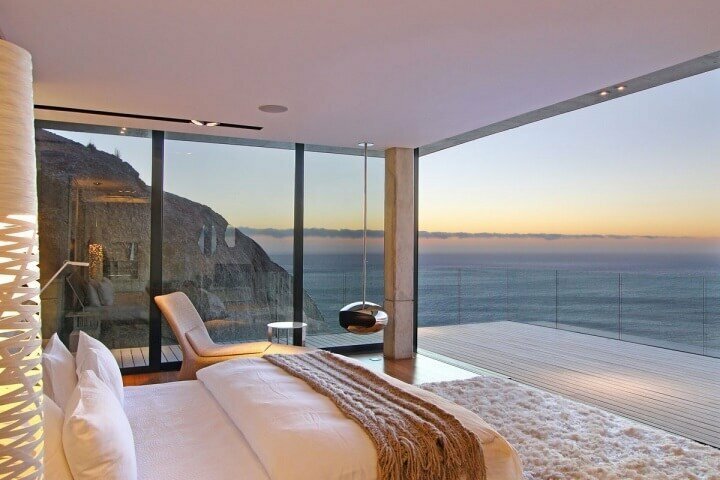 In this post we’re going to take a look at a showcase of amazing and jaw dropping bedroom designs with an ocean view. 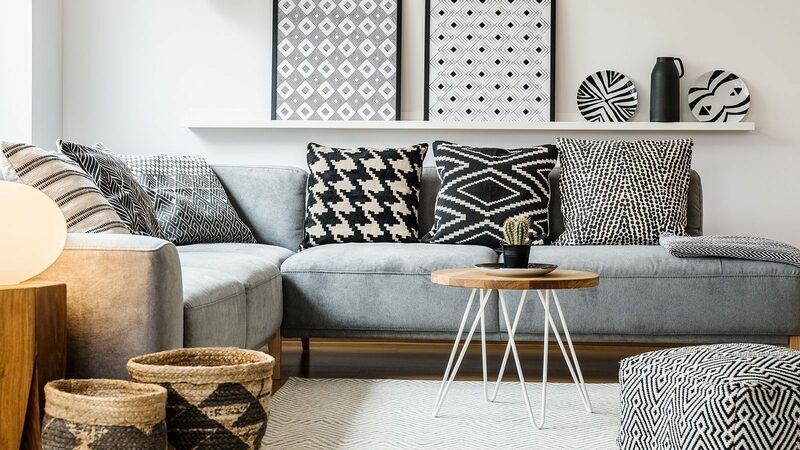 These are fantastic examples of how to incorporate an exterior view into your interior design and when it comes to exterior views pretty much nothing can beat the ocean. 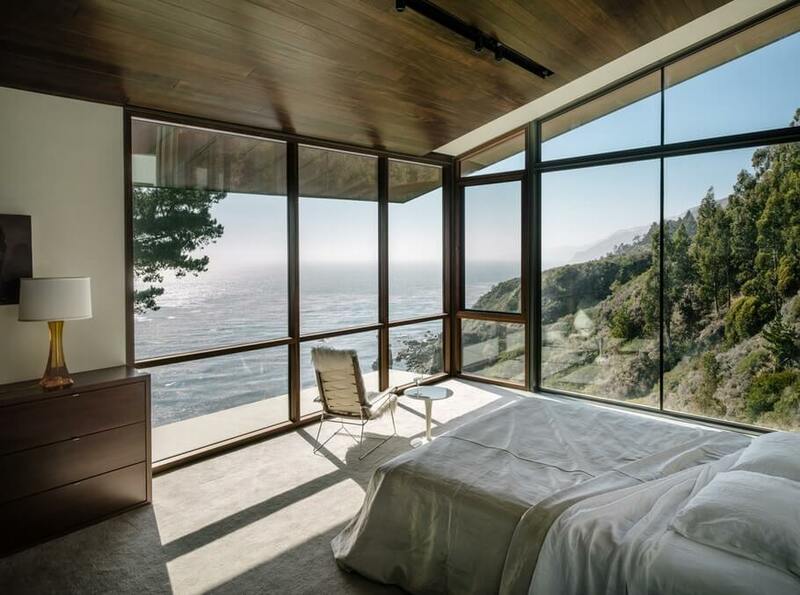 This bedroom is completely surrounded with glass walls and an absolutely magnificent view of the ocean. 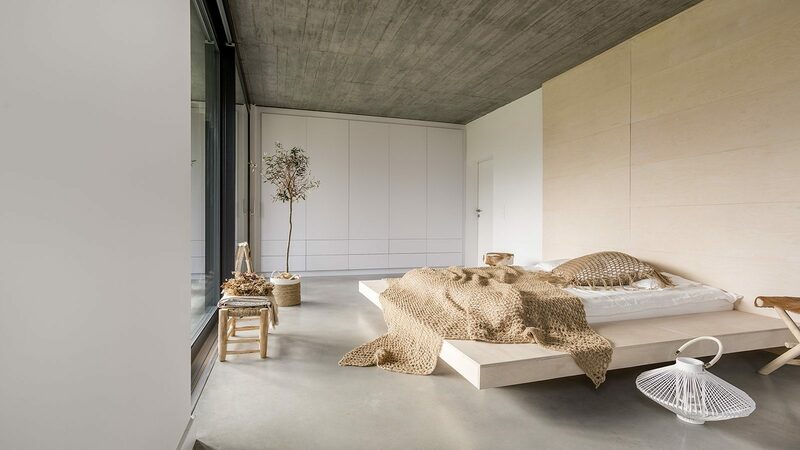 The minimalist setting is quite understandable because the ocean is the main decorate element in this totally outstanding bedroom. 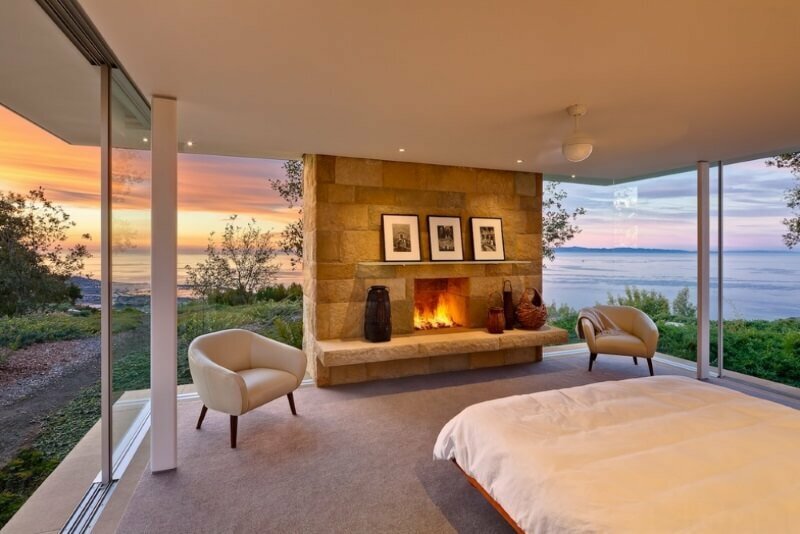 This classic and modern bedroom certainly has an amazing ocean view right? 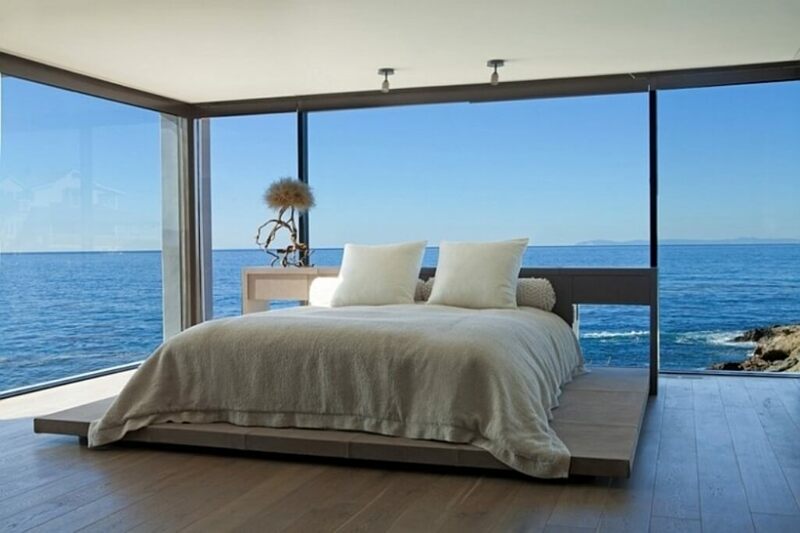 The ocean pokes through the floor to ceiling glass doors bringing a wave of freshness as well as its amazing appearance to this beautiful bedroom. Wow, just gorgeous! 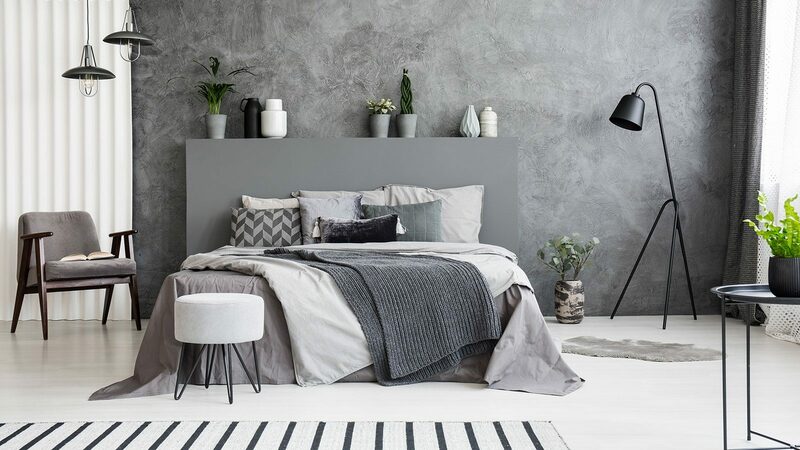 Notice the calm, tranquil and totally relaxing ambiance in this minimalist bedroom. It’s absolutely awe-inspiring right? 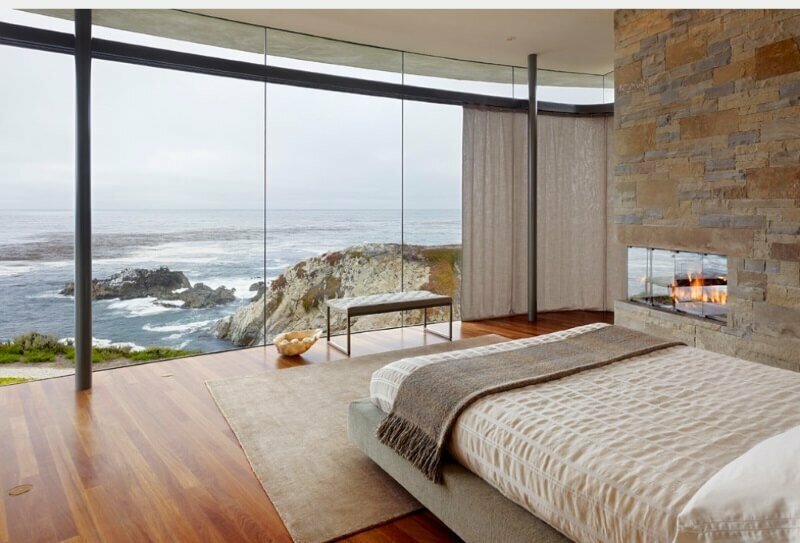 This room has a very beautiful and dreamy outlook largely due to the glass wall and the perfect view of the ocean. 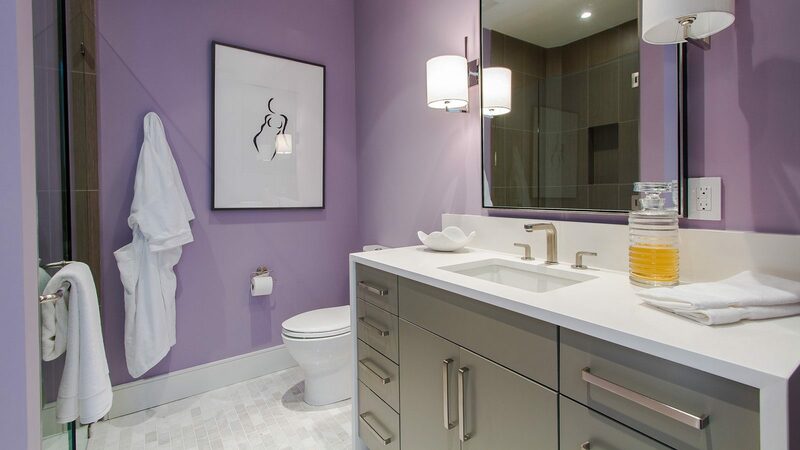 This room has everything that a perfect bedroom should have: a gorgeous modern setting, large bathtub and a view of the ocean. The floor to ceiling glass doors integrate the awe-inspiring exterior with the modern interior giving this room the perfect outlook. 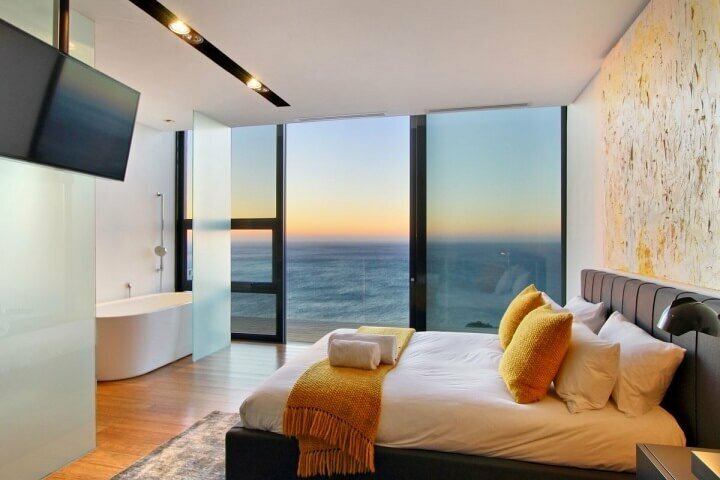 We have to say that the owners of this bedroom are incredibly lucky and privileged to wake up in this room with such an amazing view of the ocean. 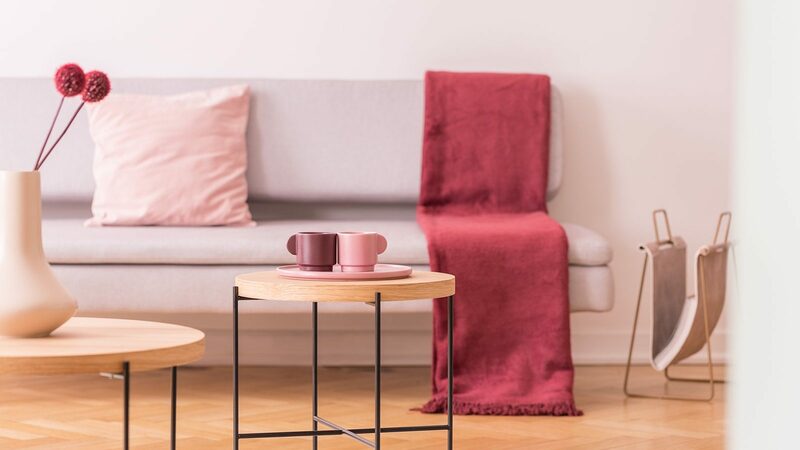 The minimalist setting enhanced by a white shag rug that bring soft texture to the space makes the room feel sleek and amazing. We love the interior of this natural and beautiful bedroom with its stacked stone wall, wooden floor and large glass walls. The ocean view is the perfect complement for this tranquil, refreshing and gorgeous bedroom. 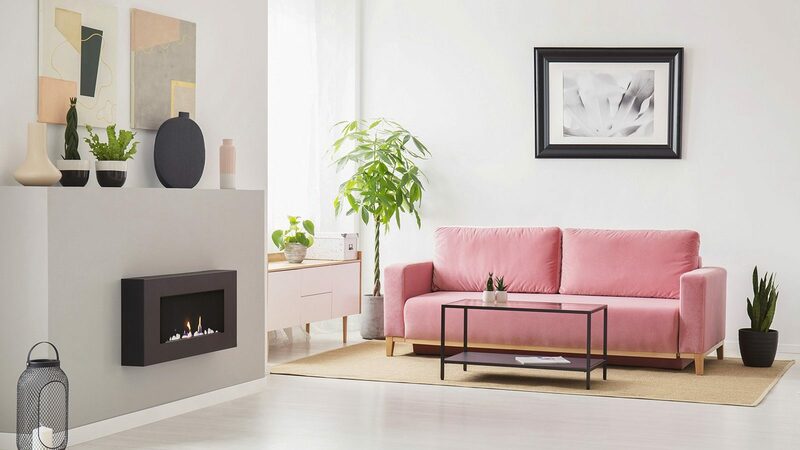 The fireplace brings a cozy charm into this minimalist bedroom while the glass walls create an open and vibrant ambiance. 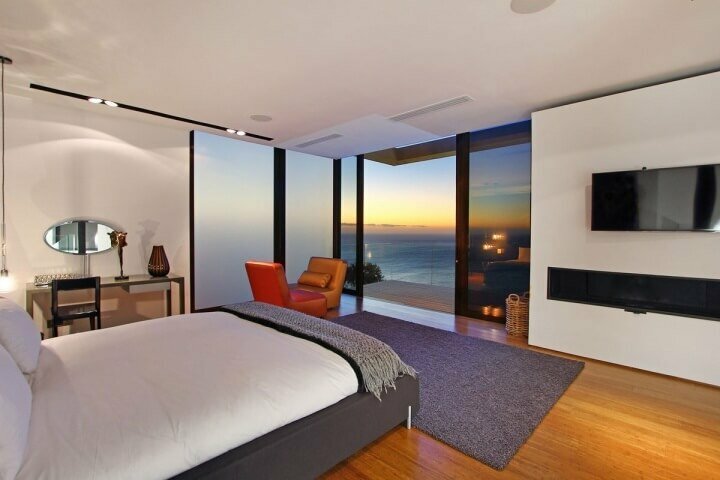 At the same time that amazing ocean view absolutely boosts up the refreshing and amazing feel of this top notch bedroom. 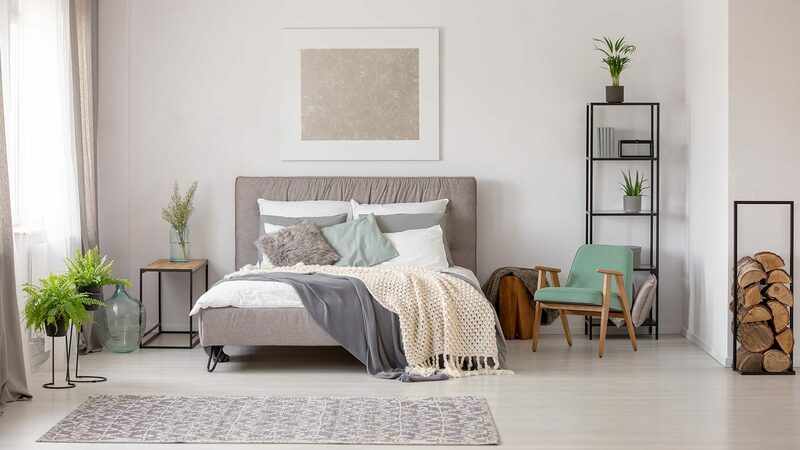 This bedroom looks completely relaxed and chill right? The wood panelled ceiling in combination with the minimalist setting and glass walls and of course the gorgeous view of cliffs and ocean give the interior an utterly bold and amazing ambiance.